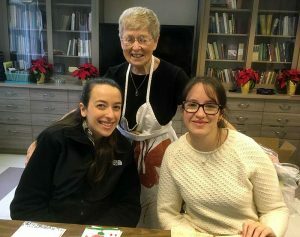 On Saturday, December 9, 2017, members of the Caldwell Chapter of Dominican Young Adults USA, students, faculty and parents from Mount Saint Dominic Academy and Lacordaire Academy, and the Sisters of Saint Dominic of Caldwell gathered together for a ‘Stamp Out Despair’ packing party at Saint Catherine’s Healthcare Center and Convent located on the Motherhouse grounds in Caldwell, New Jersey. Stamp Out Despair is a semiannual drive coordinated through First Friends of New Jersey and New York, an organization that upholds the inherent dignity and humanity of detained immigrants and asylum seekers. Through Stamp Out Despair drives, writing materials are collected and assembled into packages for detainees. The packages, in turn, give detainees the tools they need to keep in contact with loved ones. 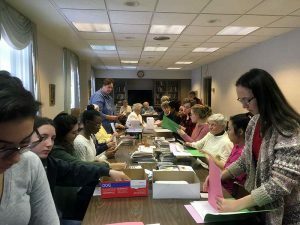 The packing party group came together to assemble 300 folders for men and women detained in the Elizabeth Detention Center. Each folder contained cards, paper, stamped envelopes, a message of encouragement and information about First Friends. 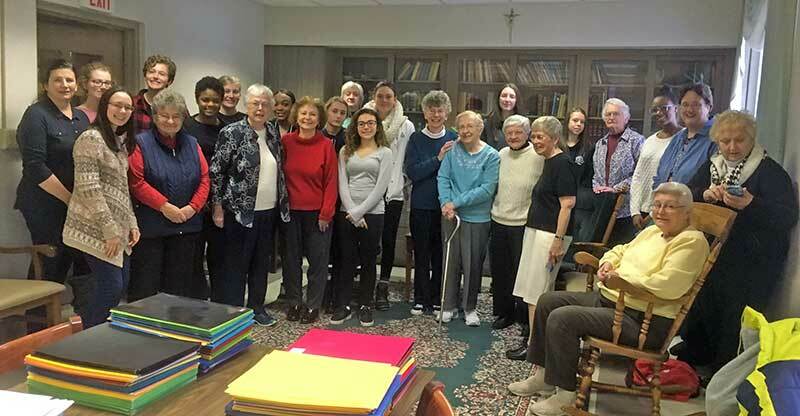 Dominican Young Adults Lindsay and Lauren worked with Sisters deMontfort Kinchellagh, OP, and Mary Agnes Sullivan, OP, to organize the materials before the rest of the group arrived. This organization facilitated the assembly line process for the others. Thanks to their help, the group was able to finish its work with rapid speed and with a sense of accomplishment and satisfaction for a job well done. Everyone took away a renewed sense of what Christmas is all about.